Pigs are one of the most peaceful mobs in Minecraft PE, used as a food source. It is unlikely that you ever thought about the fact that such pigs can become real companions who will never leave the player alone. 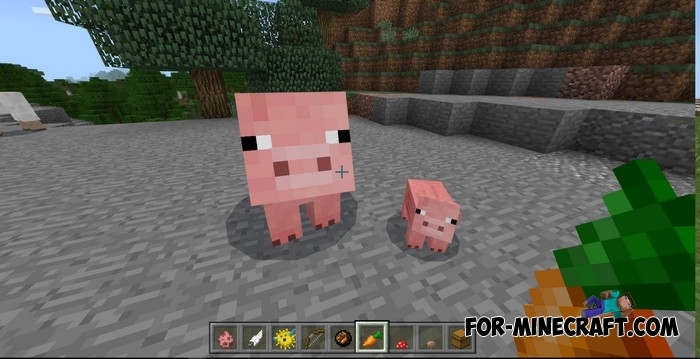 The Pig Companion addon adds not only a companion function but also new properties similar to potions effects. Feed the submitted item and then your companion will receive a new property or ability. But before that you need to tame it with carrots. Sugar increases the speed of movement. Red and brown mushrooms increase and decrease the size of the pig. Fish gives the underwater breathing effect. Pufferfish gives the poison effect. Magma cream gives the fire resistance effect. Arrows and fireballs are types of weapons that a pig will get if you tap on it. In addition, your friend has 27 slots, designed for any things. Until death, the companion will carefully store them even after you quit the game. How to install the Pig Companion addon?